This training plan is one of the 190+ Plans included with an Athlete’s Subscription. This 15-week training program is sport-specifically designed to improve short, moderate and long distance (3–12 mile) rucking performance with a 45# rucking load. This training plan deploys ruck assessments (3, 6, and 12 miles) and uses assessment performance for the follow-on progressions. In this way the plan automatically “scales” to the incoming rucking fitness and speed of each individual athlete. 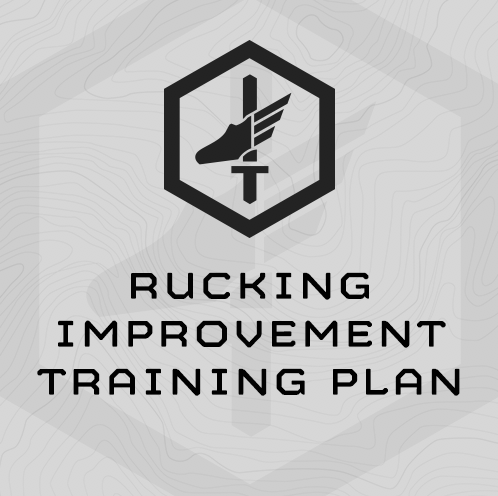 The plan is designed so athletes who have different ruck improvement needs can begin the plan in different places to address their specific deficiencies. – Working on improving your 3-5 mile ruck time, and/or are new to rucking? Begin the plan on week 1. – Working to improve a 6-mile ruck time and/or have some rucking experience but need lots of work? Start at week 6. – Working to improve a 12 mile ruck time and/or are an experienced rucker wanting to be pushed? Start at week 11. This is Version 2 of this plan, updated July 2017. • We created different start points based on the individual athlete’s ruck assessment distance, ruck fitness/experience, and/or overall rucking goals. • Plan increased from 4 days/week to 6 days/week. This 15-week training program is divided into three, 5-week blocks for the speed over ground rucking work. While the Speed Over Ground work in the plan is anchored in 5-week blocks, the longer ruck in the plan progress steadily throughout. Easy distance ruck volume increases throughout the plan and the pace is based upon your most recent speed over ground assessment. You’ll ruck easy, long distance two times/week on back to back days (Friday and Saturday). These easy rucks start at 4 miles on week one and progress to 16 miles on week 15. Total rucking volume in the plan begins at 14 miles total in Week 1 and finishes at 47 miles total on week 15. This training plan includes focused, rucking-specific leg, mid-section and upper body strength training deploying bodyweight and/or dumbbells. This program is designed to be completed as a stand alone program, but it can also be completed concurrently a strength-focused MTI or other strength training program by starting this plan on Week 6 and dropping the Tuesday and Thursday strength days from this training program. What is the Required Equipment? 1-4 hours depending upon your rucking pace. Longest days will be the Friday and Saturday long, easy efforts. If you miss a day, make up the session you missed the next day and follow the programming as prescribed. The programming is progressive – it builds upon itself. Don’t skip ahead. See our Exercise Library HERE. The Ruck Calculator is listed as an exercise. Ruck 1-Mile at per mile interval time using your SESSION 1 3-Mile Ruck Assessment and the MTI Ruck Interval Calculator. (1) Ruck 4 miles @ “Easy Per Mile Pace” using your SESSION 1 3-Mile Ruck Assessment and the MTI Ruck Interval Calculator. (1) Ruck 5 miles @ “Easy Per Mile Pace” using your SESSION 1 3-Mile Ruck Assessment and the MTI Ruck Interval Calculator. "Just wanted to say thanks for what you guys do. I completed 2 months of the 4 week Run and Ruck improvement plan (I was safe about it). I did this to compete for slots in my unit for upcoming Ranger School. I blew away everyone and I had to tell 'em about you guys. Some had heard of it before, but now I guarantee they will look harder. Keep the company alive and keep doing great things. I am hooked on your programs. I am buying the Ranger Prep packet now, I should go in Fall 2015. I can't wait to tell you guys how it goes. Thanks again."